Former Texas State Champion and six-time Austin City Golf Champion, instructor at the Barton Creek Golf Academy, and best-selling author, Barbara Puett has dedicated her life to helping others enjoy the game of golf. Barbara has taught thousands of golfers at all skill levels over 15+ years in the University of Texas Informal Classes program. And, she is a popular author and speaker on the subjects of golf etiquette and women’s golf. Barbara has had the privilege of being a student of Harvey Penick and of teaching with Chuck Cook. 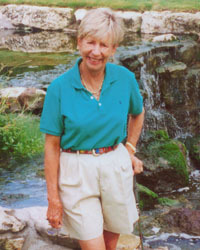 This web site provides students and friends with information about Barbara’s activities as well as about golf in the Austin area. Click here for information about golf lessons with Barbara. Click here for information about beginner and intermediate golf classes. Barbara’s other passions include animal rights and the protection of our environment.